Chronicle was one of the freshest movies we've seen this year so far, with its telekinetic teens going off the rails. This superpowered "found footage" movie comes out on DVD today, so we were excited to talk to director Josh Trank. In case you missed it, Chronicle is about three high-school kids who find a mysterious hole, filled with a glowy energy, and it gives them telekinetic powers that get stronger and stronger the more they use them. One of them, Andrew, comes from an abusive family and has a hard time fitting in, and his near-godlike powers don't necessarily make his life any easier. In older science fiction stories, they had to rely on storytelling as opposed to spectacle. The old run of the Twilight Zone, the star was the writing and the storytelling, and the characters and the twists and the cleverness in the setup and payoff and execution. I think ironically, now that visual effects have plateaued and have become so incredibly realistic and big and achievable, we've lost sight of that storytelling, and it's almost a special effect to be able to tell a compelling story. That becomes the new special effect. In Chronicle, as in real life, "people are a little more gray than typical comic book characters, who are defined by moral objectives. Most superheroes are painted with a specific moral objective, that makes them who they are. And that moral objective influences everything they do, so there's an expectation for what you're going to see out of a certain character. But here we really have no idea how it's going to end up." Because the characters are more morally gray, too, Trank's goal was to keep the audience guessing about how things are going to turn out. He keeps trying to tease that it could go in one direction, and then it goes in another. For example, the scene where Andrew swats a car off the side of the road and nearly kills a driver happens pretty early on in the film — and you think maybe Andrew's going to go bad right then. But instead, he actually behaves better, for a long time afterwards. The suspense and fake-out works, at least in part, because Andrew himself is ambivalent — part of him wants to kill that obnoxious driver, and part of him really doesn't. "So ultimately, we have no idea if he's going to learn his lesson in that scene," says Trank. And then much later, when Andrew splits a spider apart using his mind, it's no longer a tease. "It's blatant," says Trank. "He's pulling a fire alarm in that scene. He's letting everybody know exactly what's going on in his mind." Trank does not see Chronicle as specifically a movie about male friendships in this day and age — the story could have worked just as well among women in the 18th century or whatever. His biggest influence was actually, Matilda, an adaptation of a Roald Dahl story about a girl with a horrible family, that Danny DeVito directed in 1996. Trank calls Matilda "the perfect children's movie," and says that the main character, Matilda, represents "all of us," especially the underdogs of the world. She has amazing potential — "she could be the next president" — but her horrible circumstances obstruct her from being able to shine the way she should. Meanwhile, Andrew in Chronicle is similarly pushed down, but he doesn't have as much brightness and amazing potential as Matilda. "He isn't the kid who can just shine against all odds. He isn't the kid who can be happy regardless of how mean everybody else can be." "Chronicles has a lot of similar themes, about being pushed to the edge and suddenly endowed with an incredible godlike power," says Trank. "And using it for fun, and using it for destruction." Anybody can relate to the idea of waking up one morning with telekinetic powers, along with two of your friends, adds Trank. "You would unite with your friends over one very simple desire, which is living out the ultimate wish-fulfillment of flying and moving things with your mind. It's about sharing a hobby. But it's not just a hobby, it's having a godlike power. And it's how that would shape anybody's life. I was hoping this movie could be for anybody." And at the same time that Andrew gets these shared godlike powers, he also gets invited into the social inner circle by Steve, which is like two sudden pieces of wish fulfillment. "Being allowed in on the fun by a cool kid is like the ultimate thing that every kid really wants, to feel sort of validated among his peers." Steve has always been on the inside, even if he didn't have godlike powers before, so this isn't as new to him. And Steve is genuinely a nice guy, contrary to what you'd expect. Steve "has always been living that idyllic sort of magical life," says Trank. "But for Andrew, that would take him to a place he's not prepared to go to. It's not like he earned his place up in the clouds. He was just suddenly given the power. It's like the bitter crazy person who [suddenly gets handed a chance]." You have a limited time to edit a movie before it goes into theaters, and you wind up making a lot of decision on the fly, says Trank. You want the movie to have the biggest possible impact, and inevitably some stuff falls by the wayside. So for the DVD version, Trank took the opportunity to edit back in a lot of pieces that "add to the depth of Andrew's arc in the story." Also, the director's cut has "a deeper portrait" of Steve, the popular kid who becomes part of the super-powered trio and tries to bring Andrew into the school's inner circle. There are a lot of "loose ends and moments that really paint a fuller picture" of the three main kids, says Trank. With Avengers breaking box-office records, we were wondering if Trank thinks audiences will eventually burn out on superhero films. But he says there will always been a desire for "big movies," of any genre. Most romantic comedies aren't very good, but the genre keeps going, and occasionally you get an Annie Hall. Likewise, "there are as many great superhero movies as there are comedies and dramas and cartoons. People just want to see good movies." 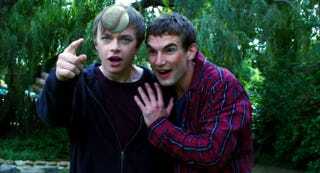 Chronicle is out on DVD today.